Someone murdered a lot of people in Las Vegas recently. I’m not going to name the suspect, because I support limiting notoriety for mass killers, as a step toward discouraging future copycats. I won’t question whether the suspect had the tradecraft skills and physical capacity to pull off the murders as stated in the MSM. I won’t question whether he acted alone, or whether the killer/s actually used the weapons and accessories in the official story. Rather, I’ll discuss first the accessories that were ostensibly used, then I’ll consider the reactions to this mass murder as they relate especially to those accessories, and finally I’ll discuss appropriate policies on those accessories. First, we’ll consider the aforementioned accessories — bumpfire stocks, or just bump stocks. Some in the MSM would have you believe that these devices “make a AR-15 fire full auto like a machine gun.” Well, no. They don’t. What they do is utilize recoil to bounce the gun in a way that helps you pull the trigger rapidly, thus approaching full auto rates of fire. You can do the same thing without a specially-designed stock, but it takes practice. Bump-firing — with or without a bump stock — is not the same as turning it into a machine gun, or firing “full auto.” Legally and technologically speaking, a “machinegun” fires more than one round per action of the trigger (fully automatic, or full auto fire). Regardless, a bump stock is not a terribly useful accessory. I think of it as a freedom-simulation device. It lets you imagine for a few gunpowder-fueled moments that you’re living in a free country, enjoying the inherent joy of firing a fully automatic weapon, albeit one with substantially diminished accuracy. 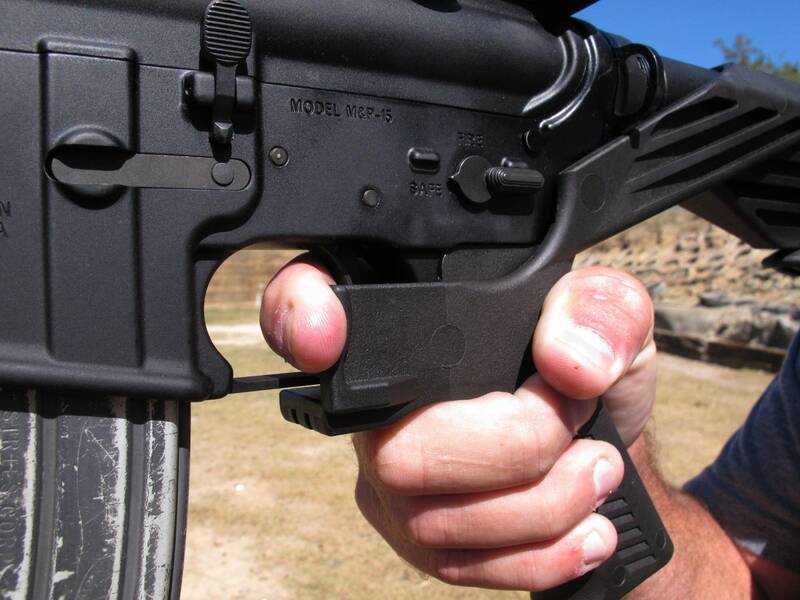 To summarize, a bump stock is a piece of plastic that helps you pull the trigger faster than normal. Having considered the accessories in question, we’ll consider the emotional reactions to the mass murder as they relate to the bump stocks. Every time the MSM decides that a deadly event is tragic enough to lead in the evening news, emotional meltdowns and calls for laws that wouldn’t have actually prevented the tragedy in question are sure to follow. No, I’m not callous to the loss of life. Sure, I’m a bit cynical. Fifty-plus dead in one night in one place is news; the same number every month or so in Chicago is discussed occasionally, but not like a single mass murder; likewise the innumerable civilian women and children killed by U.S. bombs in half a dozen foreign countries; and thousands of innocent babies murdered in contract killings orchestrated by their own mothers and carried out by medical professionals aren’t even considered murders…. This article is about the bump stocks — not those other issues — so let’s get back to how people reacted to this tragedy. As soon as the MSM could figure out what a bump stock was, there were calls to ban them. Senator Feinstein introduced a bill to ban bump stocks, and a similar bill has bipartisan support in the House. POTUS Trump is looking intobanning bump stocks. Even the NRA has gotten in on it, actually asking the BATFE to review their ruling on the accessories with a view toward issuing more regulations on them! (How many times does someone have to betray you, before they stop being traitors and start being the enemy?) To summarize, fifty-nine violent deaths instigated emotional reactions across the board, spurring normally intelligent individuals (Senator Feinstein and her ilk excepted) to irrational plots to imprison or kill people for possession of a piece of plastic. Having considered the bump stocks and the emotional reactions to the murders, we’ll now consider the appropriate policies for the bump stocks. In short — freedom, y’all. As I’ve written previously, there is no place in a free society for regulations on firearms accessories. It doesn’t matter that a bump stock is a nearly useless toy. It doesn’t matter that it’s been possible for years to 3D print one in your living room. It is immoral to imprison or kill people for simple possession of property. It is especially immoral when that property has anything to do with firearms, and thus relates to the fundamental right of self defense. All attempts to ban or restrict bump stocks — or any other firearm accessory — are antithetical to the principles of freedom we all should hold dear. Support for these bans should be countered in every available forum. Organizations that promote these bans should be boycotted. To summarize, don’t kill people over a piece of plastic, and oppose those who would — morality is pretty simple, right? In conclusion, we have considered the bump stocks, the emotional reactions to the murders, and the appropriate policies to adopt for bump stocks and other firearm accessories. It makes neither moral nor rational sense to ban a piece of plastic just because someone used one once to kill a lot of people that he probably could have killed more efficiently without the piece of plastic…. I hope this article has either clarified your thinking, or assisted you in clearing things up for someone you know.